HDL cholesterol (AYCH-DEE-EL) (koh-LESS-tur-ol): stands for high-density lipoprotein cholesterol, which is a fat found in the blood that takes extra cholesterol from the blood to the liver for removal. Sometimes called "good" cholesterol. For more information, see What You Need To Know About High Blood Cholesterol. heart attack: a condition in which the blood vessels to the heart become totally or partially blocked by fatty deposits. When the blood supply is cut off or reduced, oxygen and other needed supplies can't get through. Then heart muscle can die. Also called a myocardial infarction. heart failure: a chronic condition in which the heart cannot pump blood properly. hemoglobin A1C test (HEE-moh-GLOH-bin) (AY-WUHN-SEE) (test): see A1C. heredity (huh-RED-ih-tee): the passing of a trait from parent to child. HHNS: See hyperosmolar hyperglycemic nonketotic syndrome. high blood glucose (hy) (bluhd) (GLOO-kohss): see hyperglycemia. high blood pressure: see hypertension. high-density lipoprotein cholesterol (HY-DEN-sih-tee) (LIP-oh-PROH-teen) (koh-LESS-tur-ol): see HDL cholesterol. For more information, see What You Need To Know About High Blood Cholesterol. HLA: see human leukocyte antigens. home glucose monitor (hohm) (GLOO-kohss) (MON-ih-tur): see blood glucose meter. honeymoon phase: temporary remission of hyperglycemia that occurs in some people newly diagnosed with type 1 diabetes, when some insulin secretion resumes for a short time-for example, a few months-before stopping again. hormone: a chemical produced in one part of the body and released into the blood to trigger or regulate particular functions of the body. For example, insulin is a hormone made in the pancreas that tells other cells when to use glucose for energy. Synthetic hormones, made for use as medicines, can be the same or different from those made in the body. Humalog (YOO-muh-lawg): Brand name of an insulin product. See insulin lispro. For more information, see Types of Insulin. Humalog Mix 50/50 (YOO-muh-lawg) (mix): Brand name of an insulin product. See pre-mixed insulin. For more information, see Types of Insulin. Humalog Mix 75/25 (YOO-muh-lawg) (mix): Brand name of an insulin product. See pre-mixed insulin. For more information, see Types of Insulin. human leukocyte antigens (HLA) (HYOO-man) (LOO-koh-syt) (AN-tih-jens): proteins located on the surface of the cell that help the immune system identify the cell either as one belonging to the body or as one from outside the body. Some patterns of these proteins may mean increased risk of developing type 1 diabetes. Humulin (YOO-myoo-lin): Brand name of an insulin product. See pre-mixed insulin. For more information, see Types of Insulin. Humulin 70/30 (YOO-myoo-lin): Brand name of an insulin product. See pre-mixed insulin. For more information, see Types of Insulin. Humulin N (YOO-myoo-lin): Brand name of an insulin product. See NPH insulin. For more information, see Types of Insulin. Humulin R (YOO-myoo-lin): Brand name of an insulin product. See regular insulin. For more information, see Types of Insulin. hyperglycemia (HY-pur-gly-SEE-mee-uh): higher than normal blood glucose. Fasting hyperglycemia is blood glucose above a desirable level after a person has fasted for at least 8 hours. Postprandial hyperglycemia is blood glucose above a desirable level 1 to 2 hours after a person has eaten. hyperinsulinemia (HY-pur-IN-suh-lin-EE-mee-uh): a condition in which the level of insulin in the blood is higher than normal. Caused by overproduction of insulin by the body. Related to insulin resistance. hyperlipidemia (HY-pur-LIP-ih-DEE-mee-uh): higher than normal fat and cholesterol levels in the blood. hyperosmolar hyperglycemic nonketotic syndrome (HHNS) (HY-pur-oz-MOH-lur) (HY-pur-gly-SEE-mik) (non-kee-TOT-ik) (SIN-drohm): an emergency condition in which one's blood glucose level is very high and ketones are not present in the blood or urine. If HHNS is not treated, it can lead to coma or death. For more information, see Hyperosmolar Hyperglycemic Nonketotic Syndrome. hypertension (HY-pur-TEN-shuhn): a condition present when blood flows through the blood vessels with a force greater than normal. Also called high blood pressure. Hypertension can strain the heart, damage blood vessels, and increase the risk of heart attack, stroke, kidney problems, and death. Compare with hypotension. For more information, see What Is High Blood Pressure? hypoglycemia (HY-poh-gly-SEE-mee-uh): also called low blood glucose, a condition that occurs when one's blood glucose is lower than normal, usually below 70 mg/dL. Signs include hunger, nervousness, shakiness, perspiration, dizziness or light-headedness, sleepiness, and confusion. If left untreated, hypoglycemia may lead to unconsciousness. Hypoglycemia is treated by consuming a carbohydrate-rich food such as glucose tablets or juice. Hypoglycemia may also be treated with an injection of glucagon if the person is unconscious or unable to swallow. Also called an insulin reaction. hypoglycemia unawareness (HY-poh-gly-SEE-mee-uh) (uhn-uh-WAIR-ness): a state in which a person does not feel or recognize the symptoms of hypoglycemia. People who have frequent episodes of hypoglycemia may no longer experience hypoglycemia's typical warning signs. For more information, see Hypoglycemia unawareness. 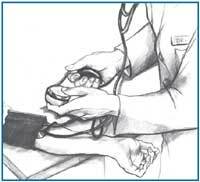 hypotension (HY-poh-TEN-shuhn): low blood pressure or a sudden drop in blood pressure. Hypotension may occur when a person rises quickly from a sitting or reclining position, causing dizziness or fainting. Compare with hypertension. IA-2A (EYE-AY-TOO-AY): see islet cell autoantibodies. IAA (EYE-AY-AY): see islet cell autoantibodies. ICA512 (EYE-SEE-AY-FYV-WUHN-TOO): see islet cell autoantibodies. ICA (EYE-SEE-AY): see islet cell autoantibodies. idiopathic (ID-ee-oh-path-ick): of unknown cause. IFG (EYE-EF-JEE): see impaired fasting glucose. IGT (EYE-JEE-TEE): see impaired glucose tolerance. immune system (ih-MYOON) (SISS-tuhm): the body's system for protecting itself from viruses and bacteria or any foreign substances. immunosuppressant (IM-yoo-noh-soo-PRESS-uhnt): a drug given to stop the natural responses of the body's immune system. Immunosuppressants are given to prevent organ rejection in people who have received organ transplants and to patients with autoimmune diseases. impaired fasting glucose (IFG) (im-PAIRD) (FASS-ting) (GLOO-kohss): a condition in which a fasting blood glucose test shows a level of glucose higher than normal but not high enough for a diagnosis of diabetes. IFG, also called pre-diabetes, is a level of 100 to 125 mg/dL. People with pre-diabetes are at increased risk for developing type 2 diabetes, heart disease, and stroke. impaired glucose tolerance (IGT) (im-PAIRD) (GLOO-kohss) (TOL-ur-uhnss): a condition in which blood glucose levels are higher than normal but are not high enough for a diagnosis of diabetes. IGT, also called pre-diabetes, is a level of 140 to 199 mg/dL 2 hours after the start of an oral glucose tolerance test. People with pre-diabetes are at increased risk for developing type 2 diabetes, heart disease, and stroke. Other names for IGT that are no longer used are "borderline," "subclinical," "chemical," or "latent" diabetes. implantable insulin pump (im-PLANT-uh-buhl) (IN-suh-lin) (puhmp): a small pump placed inside the body to deliver insulin in response to remote-control commands from the user. impotence (IM-puh-tenss): see erectile dysfunction. incidence (IN-sih-denss): a measure of how often a disease occurs; the number of new cases of a disease among a certain group of people for a certain period of time. incontinence (in-KON-tih-nenss): loss of bladder or bowel control; the accidental loss of urine or feces. incretin mimetic (IN-krit-in) (mih-MET-ik): a type of injectable medicine for diabetes that mimics the effect of incretin hormones, a type of gastrointestinal hormone. This medicine helps food move more slowly through the stomach and helps keep the liver from releasing stored glucose. For more information, see Incretin Mimetics. inhaled insulin (in-HAYLD) (IN-suh-lin): a type of insulin under development taken with a special device that enables the user to breathe in insulin through the mouth. injection (in-JEK-shuhn): inserting liquid medication or nutrients into the body with a syringe. injection site rotation (in-JEK-shuhn) (syt) (roh-TAY-shuhn): changing the places on the body where insulin is injected. Rotation prevents the formation of lipodystrophies. injection sites (in-JEK-shuhn) (syts): places on the body where insulin is injected. insulin (IN-suh-lin): a hormone that helps the body use glucose for energy. The beta cells of the pancreas make insulin. When the body cannot make enough insulin, insulin is taken by injection or other means. insulin adjustment (IN-suh-lin) (uh-JUHST-ment): a change in the amount of insulin a person with diabetes takes based on factors such as meal planning, activity, and blood glucose levels. insulin-dependent diabetes mellitus (IDDM) (IN-suh-lin-duh-PEN-dent) (DY-uh-BEE-teez) (MEH-luh-tuhss): former term for type 1 diabetes. insulin detemir (IN-suh-lin) (DET-ih-mihr): a long-acting insulin with an onset of 1 hour, no peak, and a duration of 20 to 26 hours. (Brand name: Levemir.) For more information, see Types of Insulin. insulin glargine (IN-suh-lin) (GLAR-jeen): a type of long-acting insulin with an onset of 1 hour, no peak, and a duration of 20 to 26 hours. (Brand name: Lantus.) For more information, see Types of Insulin. insulin glulisine (IN-suh-lin) (gloo-LY-seen): a type of rapid-acting insulin with an onset of 15 minutes, a peak at 30 to 90 minutes, and a duration of 3 to 5 hours. (Brand name: Apidra.) For more information, see Types of Insulin. insulin infuser (IN-suh-lin) (in-FYOO-zur): a device for taking insulin in which a small tube is inserted just below the skin and remains in place for several days. Insulin is injected into the end of the tube. insulin lispro (IN-suh-lin) (LISS-proh): a type of rapid-acting insulin with an onset of 15 minutes, a peak at 30 to 90 minutes, and a duration of 3 to 5 hours. (Brand name: Humalog.) For more information, see Types of Insulin. insulinoma (IN-suh-lih-NOH-muh): a tumor of the beta cells in the pancreas. An insulinoma may cause the body to make extra insulin, leading to hypoglycemia. insulin pen (IN-suh-lin) (pen): a device for injecting insulin that looks like a fountain pen and holds replaceable cartridges of insulin. Also available in disposable form. insulin pump (IN-suh-lin) (puhmp): an insulin-delivering device about the size of a deck of cards that can be worn on a belt or kept in a pocket. An insulin pump connects to narrow, flexible plastic tubing that ends with a needle inserted just under the skin. Users set the pump to give a steady trickle or basal amount of insulin continuously throughout the day. Pumps release bolus doses of insulin at meals and at times when blood glucose is too high, based on doses set by the user. insulin reaction (IN-suh-lin) (ree-AK-shuhn): when the level of glucose in the blood is too low (below 70 mg/dL). Also called hypoglycemia. insulin receptors (IN-suh-lin) (ree-SEP-turz): areas on the outer part of a cell that allow the cell to bind with insulin in the blood. When the cell and insulin bind, the cell can take glucose from the blood and use it for energy. insulin resistance (IN-suh-lin) (ree-ZISS-tuhnss): the body's inability to respond to and use the insulin it produces. Insulin resistance may be linked to obesity, hypertension, and high levels of fat in the blood. insulin sensitivity: the amount that the blood glucose level is reduced by one unit of insulin. insulin shock (IN-suh-lin shok): an outdated term for hypoglycemia. insulin-to-carb ratio (carbohydrate ratio): the insulin-to-carb ratio is used to estimate how many units of insulin are needed to "cover" a specified number of carbohydrate grams. For example, if the insulin-to-carb ratio is 1:12, it indicates that 1 unit of insulin is needed per 12 grams of carbohydrate in order to maintain glucose levels in the target range. This term is used primarily with insulin pumps. intensive therapy: a treatment for diabetes in which blood glucose is kept as close to normal as possible. Optimal blood glucose levels are reached through frequent injections of insulin or use of an insulin pump, meal planning, adjustment of medicines, and physical activity. People undergoing intensive therapy work closely with their health care team. intermediate-acting insulin (IN-tur-MEE-dee-uht-AKT-ing) (IN-suh-lin): a type of insulin with an onset of 1 to 3 hours, a peak at 8 hours, and a duration of 12 to 16 hours. See NPH insulin. For more information, see Types of Insulin. intermittent claudication (IN-tur-MIT-ent) (CLAW-dih-KAY-shuhn): pain that comes and goes in the muscles of the leg. This pain results from a lack of blood supply to the legs and usually happens when walking or exercising. intramuscular injection (IN-truh-MUHSS-kyoo-lur) (in-JEK-shuhn): inserting liquid medication into a muscle with a syringe. Glucagon may be given by intramuscular or subcutaneous injection for hypoglycemia. islet cell autoantibodies (ICAs) (EYE-let) (sel) (AW-toh-AN-tih-bod-eez): proteins found in the blood of people newly diagnosed with type 1 diabetes. They are also found in people who may be developing type 1 diabetes. The presence of ICAs indicates that the body's immune system has been damaging beta cells in the pancreas. The antibodies that are routinely tested for include IAA, IA-2A, ICA512, and GAD65 (also called GAD or GADA). islets (EYE-lets): groups of cells located in the pancreas that make hormones that help the body break down and use food. For example, alpha cells make glucagon and beta cells make insulin. Also called islets of Langerhans. islets of Langerhans (EYE-lets) (uhv) (LAHNG-ur-hahnz): see islets. islet transplantation (EYE-let) (TRANZ-plan-TAY-shuhn): moving the islets from a donor pancreas into a person whose pancreas has stopped producing insulin. Beta cells in the islets make the insulin that the body needs for using blood glucose.